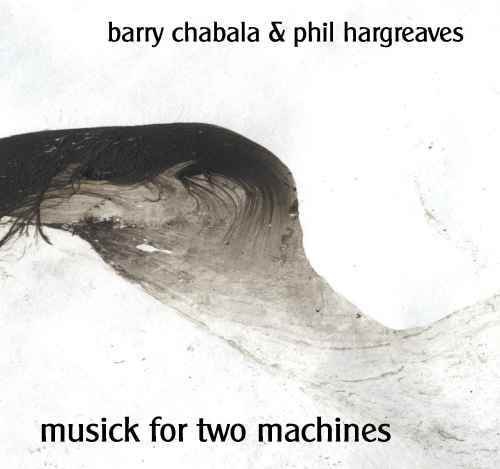 'Musick for Two Machines' is a two CD set, designed to be played on two CD players ( or MP3 players etc) simultaneously, with both machines in shuffle mode, making each play unique; one CD is Barry Chabala's guitar/laptop, the other is Phil Hargreaves' tenor sax. As such, we are not offering individual tracks but have put the tracks, grouped into folders, into zip archives. If you'd like to some idea of what it might sound like before you download, there are sample tracks of the duo available in MP3 format. Funny thing, these long distance projects. at this point, i have done quite a few things this way partly out of the necessity (the lack of playing partners who live close by), but more and more it has become because the artists are highly creative folks who happen to live far away. the ease with which data is shared over the internet also plays a big part, although i tend to think that even if we lived next door to each other, the data would be shared the same way. listening through some of the things i have done with players around the world, i am immediately struck by the result. to my ears, many times, the playing might as well have been done in the same room, at the same time. there is a certain something that happens when these pieces of music created at different times, separated by hundreds, sometimes thousands of miles are brought together. very intriguing to say the least. this music you hold in your hand is no exception - or is it? by far the largest scale project of this kind i have participated in and, to my knowledge, the first of its kind by any process. to have two musicians play separate five minute solo pieces that somehow sync up when played back together is one thing, but taking a CD full of music by each artist and playing them both at the same time, shuffled or not, is pretty cool, indeed. the idea is all phil's and its a good one. I'm not sure how much phil's playing here is with my guitar playing in mind, but his playing was always somewhere in the back of my head as i recorded & later blew apart my pieces, and when you put it all together, it makes a remarkable noise! very nice. Derek Bailey used to say that the technology he craved was a CD that would only play once; he reasoned that people would listen properly to a disk that would self-destruct at the end. Perhaps unsurprisingly, the music industry has failed to comply, but these disks are a step in that direction, as every time you play them, provided you play them in the prescribed manner, you will get a unique listening experience. Fail to pay attention, and a moment that was entirely yours will have slipped by unnoticed, and you will be unable to retrieve it. The idea originally came from a conversation I had with Glenn Weyant during the work that led to our recording Friday Morning Everywhere (whi006). At that time we were exploring the possibility of a single disk designed to be played on shuffle but with no gaps. Unfortunately, we discovered that most CD players will add extra gaps when in shuffle mode, so that idea was left hanging. Later though, it developed into something else, as unfinished trains of thought sometimes do. Although I didn't have Mr Chabala's finished disk to hand when I was recording, I was very conscious of making an artefact, a disk, that would be merely half of a whole, and of working in such a way that would dovetail and com-plement an unseen other. It would seem that he has done the same, and consequently the whole works much better than it might have done. As a footnote, I have often been told that my recordings are a little difficult to listen to. Having made one that is even difficult to play is a triumph, in my opinion, and a great blow in my personal struggle for obscurity.